The New York FFA Foundation is looking for sponsors to help students achieve goals. Being a financial sponsor of students in "Career Development Events" allows those students travel money or rewards to further their education in that career area. 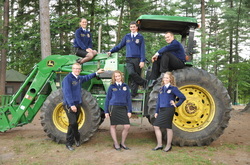 Why is the New York FFA Foundation the best choice for you to sponsor? Your money will be put to use for the kids who are the best at the state level and are competing at the national level. Plus, by it being directed by the New York Foundation, you can bet it helps those youth in our state, who just may be your neighbor. Helps industry find skill based niche employees to full future manpower needs. Helps build an "ag literate" society that promotes a better understanding of your industry. Helps keep your funds more local and focused than sponsors at the national level.